There are some amazing coupons and deals out there right now! With summer coming, your ride will probably need some cleaning! How about a $10 Petro Canada carwash card? All just for keeping your hubbys armpits fresh! When you purchase 2 Degree Mens products (which are always on sale and there are coupons), send in the form with the upc's and your receipt. The form can be found here! Love getting bonuses! Degree is usually on sale for $2, and with the $1 off coupons out there, you would pay $2 for 2 of them, but get a $10 car wash card! Bonus! Degree Men's must be purchased by June 30, 2012, and claim forms must be submitted no later than July 30, 2012. Free sample of Burberry perfume at the Bay? Click here to print the coupon! Thanks Smart Canucks! Dr. Oetker is offering another BOGO Mousse coupon on Facebook! 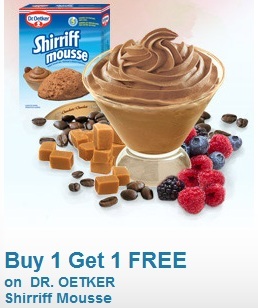 Just head over to Dr. Oetker's Facebook page to order your coupon through save.ca! print off your coupon! They have some amazing items, especially if you check out their clearance and sale items! Until next time, happy clipping and shopping! Cheers!